Editor’s Note: This is the second post of “Fantasy Baseball Preview Week!” For more info, click here. Ever since DIPS theory for pitchers was introduced by Voros McCracken many moons ago, we have acknowledged the role of luck on a much greater scale than ever before. That was the beginning of the statistical revolution. The second phase was accepting luck’s presence, but diving deeper to discover that there are indeed varying skill levels with regard to the so-called luck metric triumvirate. That trio is composed of batting average on balls in play, home run-to-fly ball rate and left on base percentage. I dub these the luck metrics because although there are some minor differences in skill among major league pitchers, the luck component is likely higher and the metrics show relatively low year-to-year correlations. Compared to traditional skill metrics like strikeout and walk rates, these three show far less variance between pitchers at the top of the heap and those at the bottom. No doubt, everyone is familiar by now with BABIP, and how important team defense and the pitcher’s batted ball profile are to shaping the end result. We also know that home ballpark greatly affects a pitcher’s HR/FB rate, as fence distances and angles as well as atmospheric conditions play a part. The 2015 league average LOB% among starting pitchers was 72.3 percent. The league leaders typically sit in the 80 percent range, while the laggards are at the mid-to-high 60 percent level. I have created my own projections for some time, and I am always seeking better methods to project players to increase accuracy. Unfortunately, there has been little, if any, research done on what drives a pitcher’s LOB% and why some pitchers with mediocre peripherals consistently post rates in line with the top pitchers in the game, and vice-versa. Clearly, there is some skill involved. All else being equal, a pitcher with a higher strikeout rate should strand more runners, just like a pitcher who walks fewer batters should strand more runners. If you allow fewer runners, you should strand a higher percentage of them. But of course, it’s not that simple. The starting pitcher’s bullpen support also factors in here, but over the course of many years, the effect of the bullpen should eventually even out. 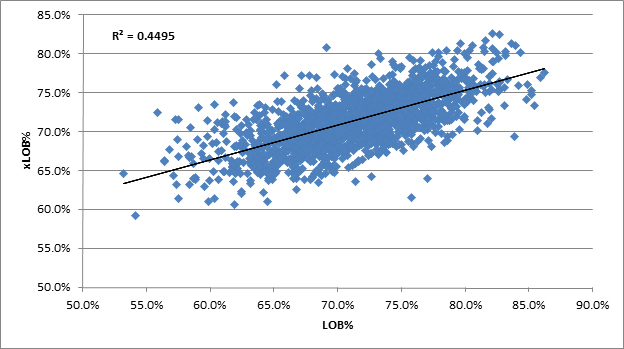 I decided to take on the challenge of determining which events fuel a pitcher’s LOB% and how to combine those variables into an equation that serves as a descriptive statistic in the vein of “what should have happened,” which I cleverly called xLOB%. I gathered every individual pitcher season from 2005-2015 with the requirement that the pitcher accumulated a minimum of 50 innings pitched and the statistics tallied were amassed only as a starter. I then put the 2015 season aside, as it was going to be used as my guinea pig to test my equation out of sample. This gave me a pool of 1,748 pitcher seasons to analyze. Singles/doubles/triples/home runs – for obvious reasons; a pitcher allowing hits of any kind means he ain’t stranding runners! Walks/Hit by pitches – grouped together because they yield the same result; not as damaging as one of the aforementioned hits, but it’s another baserunner that keep things moving. Wild Pitches – it’s not something we discuss much, since season totals are pretty low, but giving runners on base the chance to move up an additional 90 feet dramatically increases their chances of scoring. Strikeouts/True infield fly percentage – strikeouts are a pitcher’s best friend, but pop-ups (IFFB, or infield fly balls) are a close second; true IFFB% is simply FB% times IFFB%, which paints a truer picture of a pitcher’s pop-up inducing skills. Double plays induced – if you’re going to put a baserunner on with fewer than two outs, the best trick to quickly finish the inning while stranding that runner is to induce a double play. Stolen bases/caught stealings/pick-offs – a stolen base is essentially equivalent to taking a base on a wild pitch, while both caught stealings and pick-offs erase baserunners like double plays. Now that we have our test variables, the next step before a regression can be performed is to turn everything into a ratio. True IFFB% already is a ratio, so that was left alone. All the metrics above ending at strikeouts were turned into a ratio of plate appearances. So, singles became 1B%, or the percentage of singles per plate appearance. The last four metrics were turned into a ratio of baserunners, defined as the sum of singles, doubles, triples, walks and hit by pitches allowed. Since we don’t want to give extra credit to pitchers who allow a ton of base runners and induce lots of double plays, the ratios level the playing field. I was surprised that home run, walk and stolen base percentages were as low as they were and expected balk percentage to at least be on par with wild pitch percentage. With regards to the low stolen base correlation, you would certainly figure that a pitcher who allows a high rate of stolen bases is going to allow runners to score at a higher clip, thereby reducing his LOB%. But SB% had essentially zero correlation. Still, I had to include it in my regression because intuitively we know it has to matter. It was no surprise that the four overall offensive measures of batting average, on-base percentage, slugging average and weighted on-base average are highly correlated. We’ll talk more about this connection later, but it’s interesting to note the high correlation with BABIP and the meaningful correlation with HR/FB rate. Would I have liked to see a higher R-squared? Absolutely. But this satisfies and represents the furthest we have come to explaining the drivers of a pitcher’s left on base percentage. Remember earlier when I put aside the 2015 data to use for an out-of-sample correlation calculation? Well now is when we get to use it. I ran each player’s xLOB%, compared it to his actual, and the R-squared between the two was a bit lower at 0.400. I would have liked it to be just as strong, but there was only a minor loss. Once I calculated the xLOB% for all pitcher seasons, I split up the data set into right-handed (1,232 pitcher seasons) and left-handed (516 pitcher seasons) throwing groups. Anecdotally, southpaws strand a higher rate of runners, which we assume is because they face the runner on first, helping to cut down on the running game. First and foremost, I wanted to see if lefties did indeed post a higher LOB% in my population group. If they did, was it explained by better components in my equation, or is there just some bonus we need to award them with for owning some extra mystical strand skill? The four hit types between the righties and lefties were virtually identical. The lefties walked a bunch more, which would reduce their LOB%, while they failed to offset the weaker control with a meaningfully higher strikeout rate. So far, there’s nothing to see. It’s not until we get to the double play percentage, where we find a possible explanation. Even though lefties in this group were better at inducing double plays, oddly they actually posted a marginally lower ground ball rate than the righties! The correlation between GDP% and GB% for all pitchers was a robust 0.523, so one would think that the lefties, by virtue of the higher GDP%, would have also generated a higher rate of grounders. Is there something about where fielders set themselves that they are in better position to turn a double play when a lefty is on the mound? Maybe runners take shorter leads, making it easier to record the first out at second base. It’s definitely some food for thought. As we move along from GDP%, we find exactly what we expected to see – a significantly lower stolen base percentage. Surprisingly, the caught-stealing percentage wasn’t much higher. Perhaps the data suggest that runners are simply more careful when a lefty is on the mound, picking their spots to run more sensibly to ensure they aren’t caught. We have our explanation right in the stats – lefties induce a higher rate of double plays and allow a lower rate of stolen bases. I’m slightly less confident that GDP% is an innate quality of the southpaw, rather than just a fluke of this data set, but the dramatically lower SB% is certainly for real. Due to the differences in underlying skills, right-handed starters posted a weighted LOB% of 71.9 percent, versus 72.4 percent by lefties. Their xLOB% marks yielded a similar gap. The good news is that we need not worry about tacking on a “left-handed bonus” constant to the end of the equation. So we now know that this equation does a reasonable job of explaining a pitcher’s LOB%, as a backward looking, descriptive metric. Does it also do a reasonable job as a predictive one? I didn’t design it as such, but it would be wonderful if it was. As alluded to in the second paragraph, LOB% correlates weakly on a year-to-year basis. About three years ago, Matt Klaassen calculated the correlation from 1955-2012 as just 0.226, which was easily the lowest of all the pitching metrics tested (BABIP finished second lowest at 0.351). I calculated the year-to-year correlation of LOB% in my data set at a slightly lower, but very close, 0.216. You want some names, don’t ya?! I filtered the list to display only starters who pitched for at least three seasons in my data set and then calculated the average difference between their LOB% and xLOB% per season. I then sorted the list by the average difference to find the pitchers who that have outperformed and underperformed the most. These are your outliers, who either possess/lack other unique skills not accounted for in the equation, or were the special beneficiaries/non-recipients of lady luck’s handouts. You cannot possibly dream up a more boring list of starting pitchers! Orioles starter Miguel Gonzalez easily led the way by outperforming his xLOB% by a whopping 5.9 percent per season. Including 2015, he has alternated 80 percent-plus LOB% marks with slightly above average rates. The rest of this list proves that if a consistent outperformer did exist, it is unlikely to be a name you could guess. This is not a list of the top performers in the game. What does this group have in common that allowed it to outperform so significantly? Beats me. The group mostly consists of lower strikeout pitchers, which is not the type you would expect to find here. But wait just a second. Sorting the entire list by the LOB%-xLOB% gap and then comparing the weighted strikeout percentage of the top 100 outperformers to the top 100 underperformers resulted in something fascinating. The outperformers posted a 16.9 percent strikeout rate, while the underperformers posted a 17.5 percent mark! Perhaps the equation is too harsh on the pitch-to-contact types, or again, this could just be the randomness of the data set and the strikeout rate difference means nothing. We have to drop down to pitcher 13 on the outperformer group to find a name we can all agree enjoyed an excellent career – Roy Oswalt. He outperformed his xLOB% by 3.1 percent over eight seasons, which seems like a large enough sample size to conclude this was no fluke. We then find Jered Weaver hanging out at spot 18 with an average outperformance of 2.8 percent over nine seasons, followed by…Randy Wolf, at 2.7 percent over eight seasons. Surely this is one of the few things Wolf has done better than the vast majority of the starting pitcher population. This group is quite a bit more interesting. And, it even features a two-way player in Micah Owings who can hit as well as pitch. That’s exciting, right? Sadly, Andy Sonnanstine was by far the worst underperformer and his underperformance outpaced the leading outperformer. The soft-tossing junkballer threw a variety of pitches and eventually faded out his fastball to use his cutter exclusively instead. It didn’t matter, as he was out of baseball after five seasons with the Rays after recording a gruesome 5.26 ERA over 540.1 innings. If we continue down the list and stop at the fourth guy down, we find Rich Hill, who has thrown more than 100 innings only once in a major league season since 2005. Having been long forgotten, he got a chance with the Red Sox last year and out of nowhere posted elite skills and a microscopic 1.55 ERA over four starts. Perhaps he learned how to strand runners this time around, as he posted an inflated 87.9 percent mark over the tiny sample. Next, look at the name two down from Hill. It’s 2015 NL Cy Young award winner Jake Arrieta! 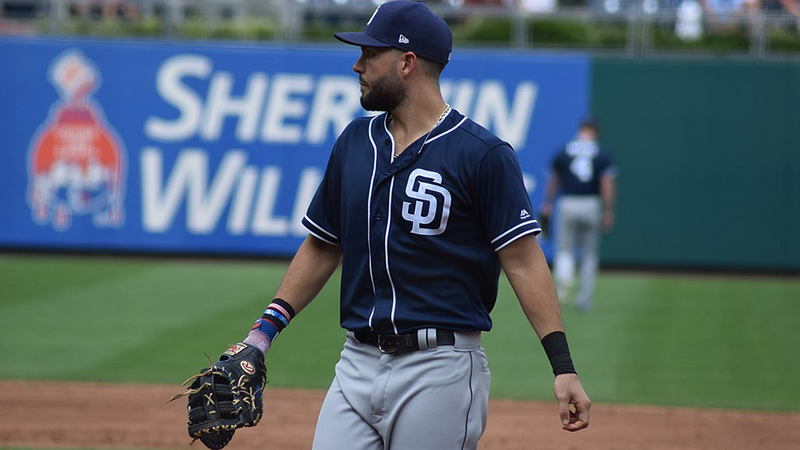 Whatever had afflicted him earlier in his career may have been cured, as he posted an 80 percent LOB% in 2015, fourth in baseball among qualified starters. Third from the bottom is 2015 Hall of Fame inductee Randy Johnson. The seasons included in the data set were his last five years when his underlying skills were clearly inferior to his vintage days. Is there a common thread among this group that might explain their underperformance or was it just random? Not that I was able to uncover. And after all, somebody is going to underperform expected metrics and somebody is going to outperform. We just don’t know who that somebody is ahead of time. Further down the underperformers group is a very interesting name – Stephen Strasburg. If anyone is wondering why he has been perceived as somewhat disappointing throughout his short career, this provides one of the explanations. The gap between his actual LOB% and xLOB% widened even further after 2015, as he posted 70.7 percent and 76.9 percent marks, respectively. In the four years included in the data between 2010 and 2014, Strasburg severely underperformed in two of them, which made up the entirety of his average underperformance. In the other two years he finished within a percentage point of his expected mark. Obviously, we haven’t yet reached the finish line and we may never. As more granular data becomes available and we continue to dive in, we might eventually discover more answers to the LOB% question. Unfortunately, the role of fortune is very real and is going to limit how much we can predict this metric, no matter how many additional pieces of information we get our hands on. For now, calculating a pitcher’s xLOB% will provide you with a slightly more educated guess as to where his left on base percentage will be the following year than the actual LOB% the pitcher just posted. Did you consider the possibility that there might be something about where batters set themselves when a lefty is on the mound that results in a higher GIDP rate? Yes I mentioned this in the post. You have to just assume though that this effect is muted over a number of years. Certainly over one year relievers can wreak havoc though. I’d argue it [abnormal LOB% rate] could persist over many years with the same manager. Despite their protestations, most SPs would have a better LOB%, the earlier (within an inning) that the manager pulled them. Getting to third on a single or home on a double. My guess with all this data it incrementally adds up too slightly higher LOB% for lefties. The problem people run into is doing a regression on in-sample data and then using that formula to predict year x+1. The proper way to do this is to run the regression with the dependant variable being from year x+1. This will not give so much weight to things like GIDP% and IFFB% which have a huge correlation to LOB% for in-sample, but much lower correlation for year x+1. The formula won’t look much different overall other than lower coefficients on those two metrics, but it will be better for prediction purposes. Excellent point. I hope more authors use this methodology. Not that it’s perfect — it’s still going to be over-fit to the past — but a better approach to come up with an accurate predictive formula. Remember that my intention wasn’t to create a predictive metric. I would have employed a different method to do so. But I figured with what I had already done, I might as well test its predictive value as well. I typically create descriptive metrics, like this one, and then run historical marks to use as my new guide for the following season forecast. So rather than the formula itself projecting 2016, I’ll calculate historical marks for the pitcher and then use those to determine my ultimate forecast. That’s captured in BABIP, which is further accounted for in the number of hits allowed. So it’s definitely factored in.